As a Colorado mountain wedding photographer, 2018 has been another amazing year. So many wonderful clients. New adventures. A new vision for my photography. And most importantly, the BEST memories to last a lifetime. Being a Colorado mountain wedding photographer has to be one of the best jobs ever. I get to work with amazing couples who value adventure, love, and the biggest smiles. Their smiles make me smile. And I hope you enjoy this post showcasing some of my favorite smiles from 2018. 2018 was surely a good one, but I’m so excited to see where 2019 takes me as a Colorado mountain wedding photographer. This year, I’ll be making an extra special focus on working with couples who share similar values as me, fueled off of adventure with an undying love for the outdoors. These are the couples that set my heart of fire and help me produce the most genuine, candid and vibrant images. ENJOY these amazing photos that I had the honor of taking! Recently, I’ve started to put extra special focus on candids during sessions. Laci & Steven were the perfect couple to kick this off with for their fall mountain engagement session at Bear Creek Dog Park. 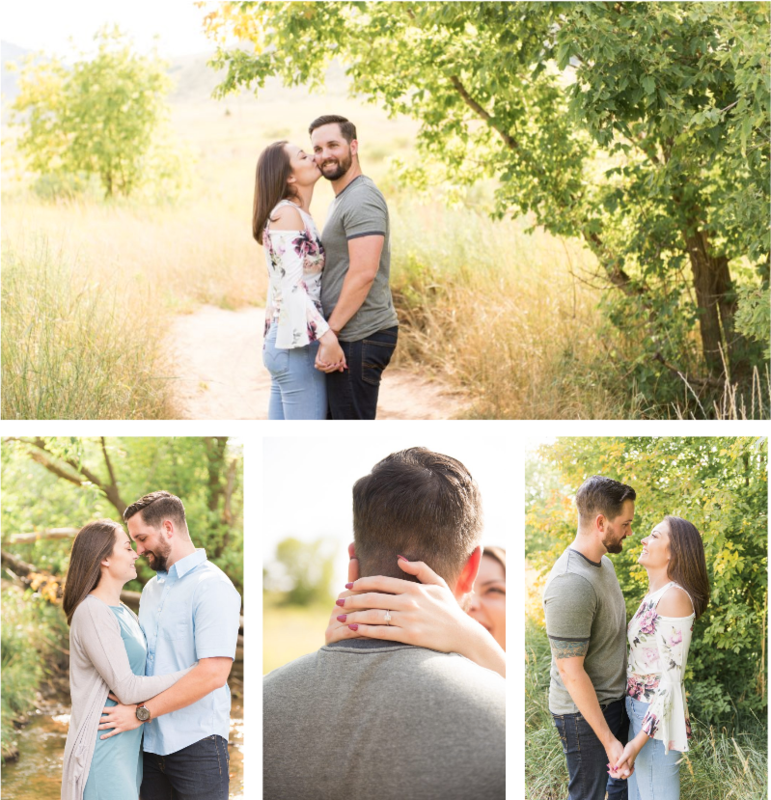 These two are getting married at the Rustic Lace Barn in Colorado Springs next September, and thanks to being on their preferred vendor list, they found me on the list and selected me as their wedding photographer. YAY. 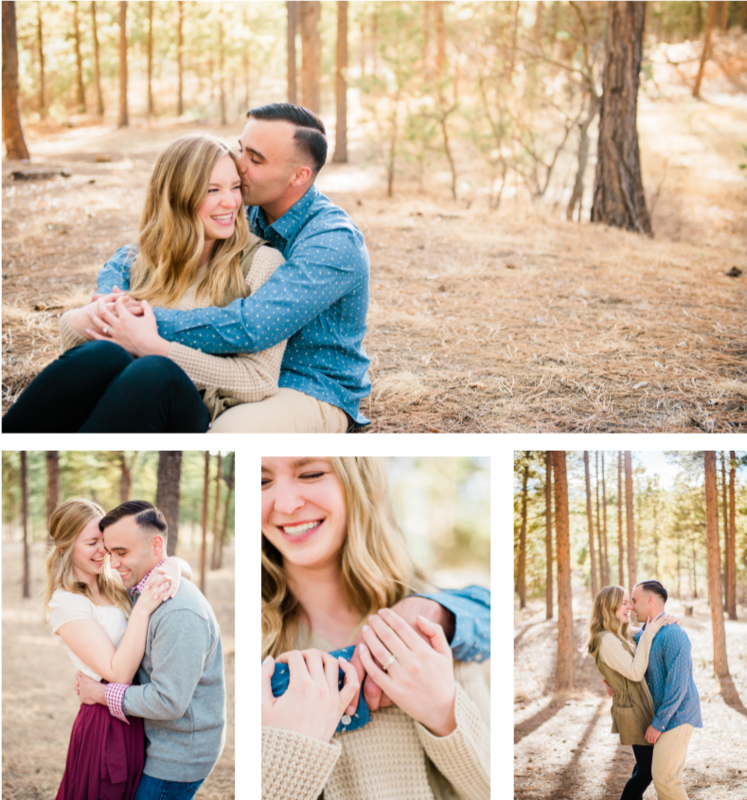 They came down from Fort Collins to meet me in the Springs for their fall mountain engagement session. It was the perfect day, as the sun was shining and the leaves were just about at their peak color. I’ll tell ya, I just love it when couples are fun and loving in front of the camera, and Laci & Steven were just that. They danced, they smooched, they giggled and they joked. And they even laughed at my jokes. The PERFECT subjects for my new focus on candidness (is that a word? ), and a couple I’m so excited to photograph next fall for their gorgeous wedding. Anyone looking for a fun mountain engagement session should get some tips from these two lovebirds! I’m sure you’ll be able to tell I was smiling the whole time behind the camera. A Matthews Winters park engagement session for the books for sure! Gosh, I absolutely LOVE it when couples are so in love, it’s like I’m not even there. The couples that I barely have to prompt or pose light my heart on fire. Lena & Colton were one of those who couldn’t stop smiling and looking at each other. They kissed, they laughed, the snuggled, and held hands. I kid you not when I say this, Colton said, verbatim, “I just can’t stop kissing her, she’s so beautiful”. That’s genuine love right there! 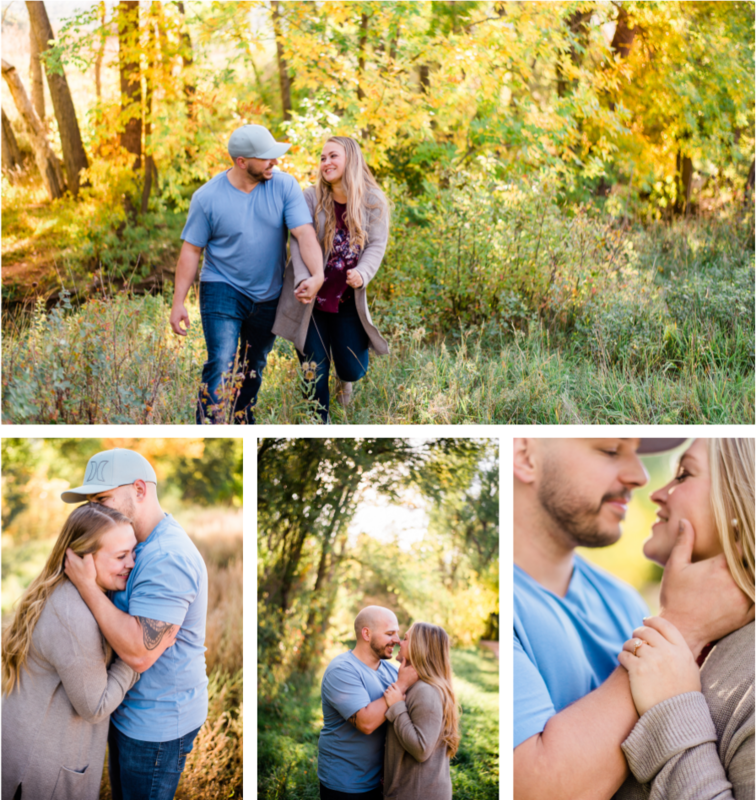 I’m so happy I got to capture these two lovebirds in the first peeks of fall as they shared some fun moments frolicking amongst the nature for their Matthews Winters park engagement session. Who would think that a Fox Run Park engagement session would lead you to a great friend?! You know when you meet people and nearly instantly click? Yeah, that was David & Erika. I LOVE it when I meet people who are just like me. People who get my quirks, think my jokes are funny, and love to laugh. This was them to a T. I mean, Erika and I may have agreed that while your fiance is on a 9 month deployment, it’s okay to move some of his clothes out of the closet to make more room for yours. See? We’re a perfect fit, and I’m so excited for Erika to move to Colorado Springs in May to move in with David. Engagement session inquiries are some of my favorite to get. But to make one even better, is when you get one from a friend from college. 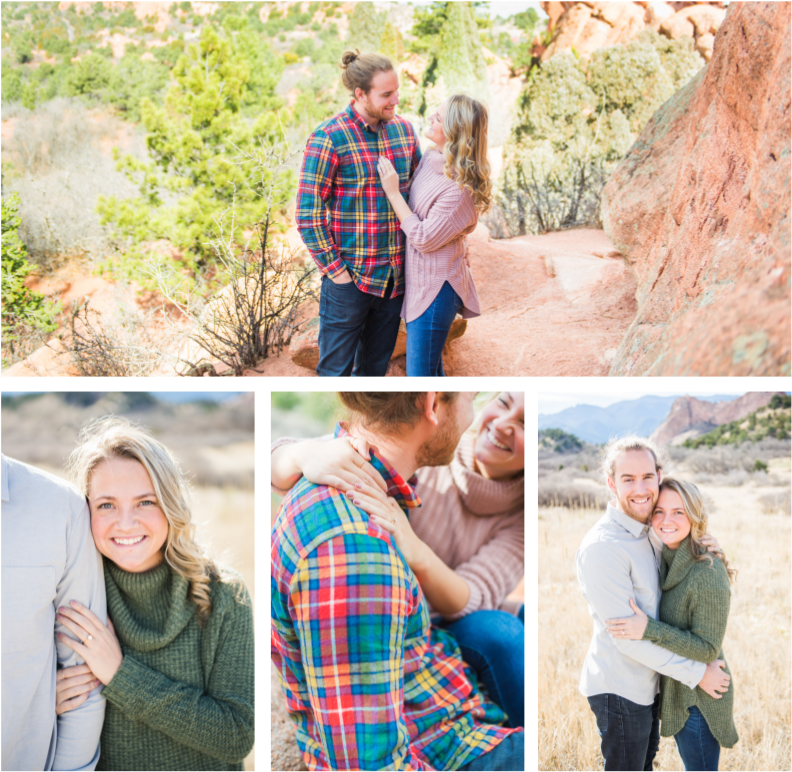 I went to Penn State with Jess and was so excited when she told me she and her brand spankin’ new fiancé would be traveling to Colorado for Thanksgiving and wanted a Colorado Springs engagement session at Garden of the Gods. They were so freshly engaged, that she hadn’t even announced the proposal yet outside of close friends and family, and wanted to wait so she could use the engagement photos to let the cat out of the bag. I was HONORED. It was a perfect, and pretty typical, actually, November day in Colorado with the sun brightly shining and showing off our gorgeous mountain landscape. Their Colorado Springs engagement session at Garden of the Gods was just stunning. I’ll never get sick of the bright orange rocks. Jess and Matt surely make a great pair and I’m so excited that they’ll be getting married next next June in Pennsylvania. What lucky people these two are to have found each other! Welcome friends! I'm so glad you're here! I can't wait to go on an adventure with you and capture your extra special moments for you to cherish forever. 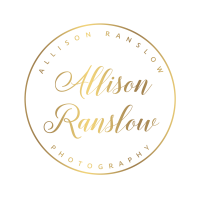 Check out my page and photos and contact me if you are interested in setting up the most fun photography session you'll ever have. I'm so excited to work with you!